Experience the fantastic city of Madrid and spend 3 unique nights at Parador hotels in Alcalá de Henares, Segovia and Salamanca. Enjoy tapas in Madrid, experience world famous museums, watch a football match and pamper yourself with the huge selection of shopping possibilities from interesting stores to select boutiques, and eat at restuarants providing the best dining in the city. In short, experience the heart and the beat of Spain! The hotel in Madrid is situated in city's centre, with plenty of tapas bars just around the corner and is within walking-distance of the most important sights of the city. After 3 nights in Madrid, three stunning nights at the fantastic Parador Hotels await you in three reknowned historical cities close to Madrid. Car rental** for 3 days or bus/train ticket between the cities is included in the price*. Salamanca represents one of the most beautiful cities in all of Spain and in particular the famous Main Square, the Plaza Mayor, belongs among the absolute highlights of the city. The entire ancient centre of Salamanca is like one big museum, with one beautiful building following another all around the two cathedrals of the city. Salamanca is the stronghold for the famous Spanish black-foot ham and it is, of course, criminal to leave the city without having enjoyed a taste of this delicious prime-quality ham. From here the journey continues to Segovia, which is world famous for its Roman Aquaduct and its ancient center, which are both proclaimed as World Heritage Sites by UNESCO. The Castle of Alcázar appears to have been taken out of a fairy tale. The interesting history of the city is exciting to explore and the local regional gastronomy, which features suckling pig and lamb, is famous in all of Spain. The Parador Hotel of Segovia is situated in the outskirts of the city, but it has a beautiful view over the area. Alcalá de Henares has an important and glorious history. During the 1st Century it was one of the Roman´s most important Spanish cities. Later the Moors occupied the city for following centuries. This changing and fascinating history gives testimony in the traditions, architecture and regional gastronomy of Alcalá de Henares. The Parador Hotel is placed in the centre of the ancient city and offers guests a luxurious spa and wellness facilities. Madrid - Salamanca: 225 km, 2h 20m. Salamanca - Segovia: 155 km, 1h 50m. 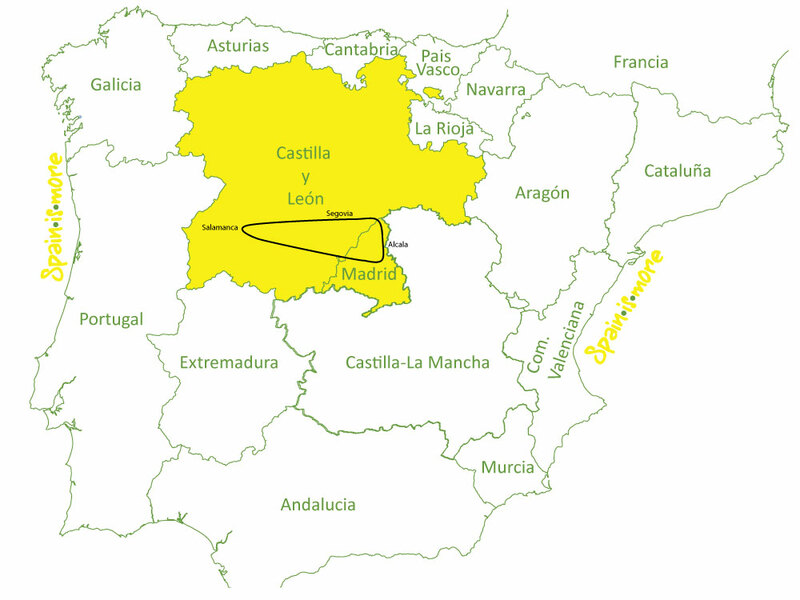 Segovia - Alcalá de Henares: 125 km, 1h 30m. Welcome to a most unique experience! Arrival in Madrid and check-in at the charming and central 4-star hotel. Example Day 1: Experience the many exciting and diverse places in Madrid. Madrid is a modern metropolis with approximately 5 million inhabitants that also holds a wonderful historic center full of atmosphere. Three days in Madrid can offer a variety of experiences; it all depends on your personal tastes and preferences. Today you could spend your time getting an overview of the city by starting with a tour of the historic city centre starting at the Plaza Mayor and Puerta del Sol where the city begins to unfold. Here you can enjoy the day in a very Spanish manner in the tapas bars that you will find in the neighbourhood of La Latina and perhaps chose to end your day by watching a flamenco show in the evening. Example Day 2: This city is world famous for its museums such as El Prado being one of the world’s absolute finest. At the Reina Sofia Museum you won't want to miss Picasso's enormously famous and large "Guernica." If you do not spend the whole day at the museums, there are lots of other attractive options. Experience the many upbeat and classy stores in Madrid, ranging from the fashionable, expensive boutiques at Calle de Serrano to the more creative and alternative stores in the boroughs of Chueca and Malasaña. Whether or not you are a football lover, one of the world´s most important 'football sanctuaries' is found in Madrid, since it is the home of the Real Madrid football team and the Estadio Santiago Bernabeau, whose museum is also worth visiting. Example Day 3: Madrid is the city of opportunity. How about a visit to one of Madrid's beautiful parks, laze around Retiro or Casa Campo. If you prefer more action you can visit Warner Brothers pendent to Disney World, located just outside the city. Madrid is full of surprices and there are always exciting new corners to explore. The rental car can be picked up early in the morning after which the tour continues to Salamanca. This old university city is just like one big museum and the many students make sure that this is never a boring place. The city holds, among other things, one of the most beautiful squares in Spain. The tour goes southeast to the city of Segovia. Here you will find the world famous and UNESCO world heritage Roman aquviaduct and an athmospheric old town. A great city to explore and enjoy and the view from the Castle Alcázar is amazing. The castly inspired Disney to the faritale of Snowwhite. The area is known for its 'cuchinillo' which are small pigs, coocked to perfection. Dont miss this traditional meal. The tour continues to the historic city of Alcalá de Henares, which is situated east of Madrid. The city is birthsplace for Spain's most famous writer, Miguel de Cervantes and the old historic town is full of churches, monestaries and beautiful historic buildings. 6 nights: 3 in Madrid and 3 nights in 3 differerent Parador Hotels. Car rental 3 days** (Ford Fiesta or similar) OR bus/train connection between cities (please tell us your preferred option when booking the tour). Departure on thursday or Sunday. *Bus/train is included between bus/trainstations. Not from bus/trainterminals to hotel. **One-way fee for picking up the car in the city centre of Madrid and deliver in airport is not included. Must be paid at pick-up. Additional driver can be booked at pick-up. Extension of stay in Madrid or elsewhere can be arranged. The price include 1 Spain-is-More-Travel Guidebook per every 4 travellers. More copies can be purchased when booking for 20€/copy, or 30€/copy if you ask for it with less than 6 weeks prior to departure.